Key topics of interest for product manufacturers, such as liability and warnings, proper content for ANSI Z535 safety labels and specific standards information. Many workers die each year as a result of arc flash explosion accidents – and most are killed because they weren’t wearing the proper PPE. 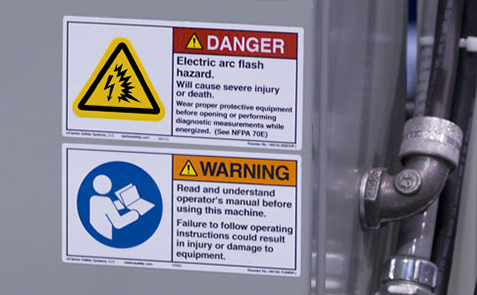 Your adherence to the use of proper labeling on electrical equipment can help to protect people from the risk of arc flash explosions. The Chinese government’s Restriction of Hazardous Substances (RoHS) regulation was developed independently of Europe's RoHS directive, though there is substantial overlap. 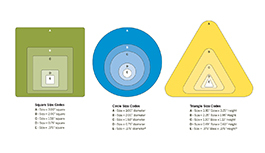 Our China RoHS labels conform exactly to the design rules set by Chinese regulations, to keep you in compliance. The “Globally Harmonized System of Classification and Labeling of Chemicals” (GHS) was adopted by OSHA in 2013. 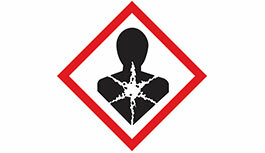 If you’re a product manufacturer with chemical hazards related to your products or processes, we recommend using the appropriate GHS pictogram in the symbol panel of your product safety label. 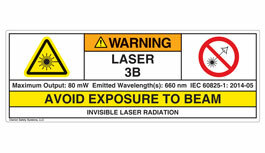 There are two main standards to follow when it comes to compliance for laser labeling: CDRH for U.S. markets and IEC for international markets. 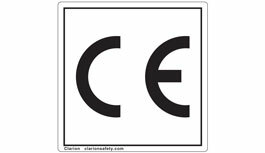 Understanding these standards and finding the laser label that meets your requirements is easy with Clarion's online resources. Too much is at risk for you to compromise on material choices. Our safety labels are only manufactured with premium quality materials; we offer our customers the finest adhesives, base materials and overlaminates, including 3M materials. Even if your material durability or installation requirements are unique, know that we can find a solution for you! Performing a risk assessment on your product during its various design phases has become an essential part of nearly every product manufacturer’s development process. Risk assessment is all about identifying possible hazardous situations that could occur during your product’s lifecycle and then finding ways to eliminate or reduce the risks associated with those hazards. 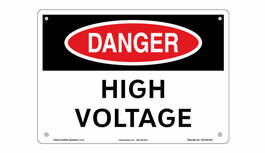 The content of your product's safety labels is incredibly important. Incomplete or inadequate content can lead to accidents that result in personal injuries, deaths, property damage and costly litigation. The purpose of your product’s warnings is to call attention to the most important safety messages that people need to know and obey. 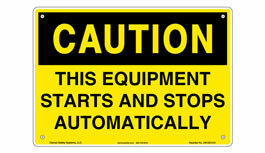 Installing too many warnings can lead to “information overload” and your warnings are ignored. 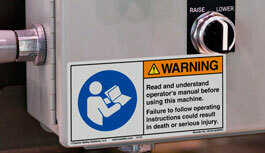 Here’s where placing some of your product’s safety information in its collateral material and using our “read manual” labels can help. 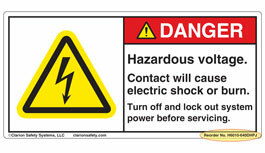 Europe’s Restriction of the Use of Certain Hazardous Substances in Electrical and Electronic Equipment (RoHS) directive limits the use of certain types of materials in products (such as lead or cadmium) and gives strict rules on how to identify – with our labeling – the actual content amounts of hazardous substances in your products. 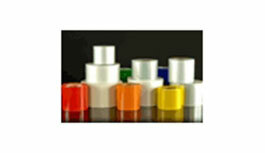 There are several factors to think about when defining the quantities to order for each of your labels. Multiple placement locations, quantity of products produced, label shelf-life, and installation procedures are all considerations that play a part in answering the question of order quantities. 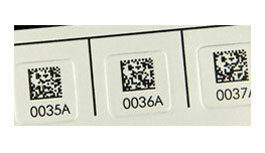 Printing and design technology now makes it possible to accommodate your need for serialization or barcodes – allowing labels and identification markings to have unique, clear information printed on them. 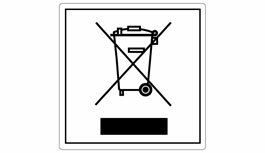 The Waste Electrical and Electronic Equipment (WEEE) directive sets collection, recycling and recovery targets for all types of electrical goods with the purpose of dramatically reducing the amount of harmful waste materials that are dumped into landfills each year. 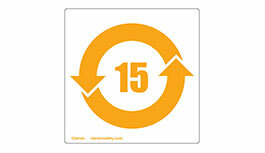 We carry a variety of these important labels to help you correctly identify your product.